Born in March 1918, of Shotton in Flintshire, Gerald was working in the steel shop of J Summers and Son Ltd’s Hawarden Bridge Steel Works at Chester before he joined the RAF in September 1936. RAF Sealand was his posting as an Aircrafthand under training. 535005 Davies rank on entry was the common lot of young recruits: Aircraftman Second Class in the lowest (Group V) Trade. The photo was taken at RAF Sealand, still an RAF base and some 6 miles from where Gerald’s nephew now lives, in North Wales. He wears the propeller badge of the Leading Aircraftman on his right sleeve, the pre-war airman’s peaked hat, no trade or aircrew badge at this stage. “Recommended for and desirous of training as a Fitter Armourer” his Form 543A records of the 18 year old Davies. Applying himself industriously, he was soon recording steady progress with a succession of VG, Satisfactory and Superior ratings as an Armourer. Accordingly he quickly advanced in rank, to AC1 and a fully trained armourer by July 1937 with No 98 Bomber Squadron at Hucknall, and to LAC by February 1938. Then came the change in direction that was ultimately to take him to the Middle East and 211 Squadron: at the end of 1938 he completed an Elementary Air Navigation course, and by January 1939 he was an Air Observer under training. Something of a struggle with the maths of navigation only delayed him briefly in proceeding through No 26 Training Group to No 4 Air Observer School, West Freugh. Though the notion of permanent aircrew was still to come in those early days, there in April 1939 he was made Corporal. By the end of May he had achieved an A rating on the Air Observers course and was posted to No 207 Bomber Squadron at Cottesmore, an acting Sergeant (and acting Air Observer), flying with the Squadron’s Avro Ansons. 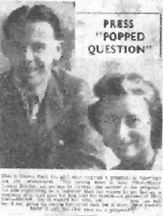 The war came, and then in late November 1939 he was fully qualified: authorised to wear an Air Observers Badge. 207 Squadron was to be re-formed as No 12 Operational Training Unit in April 1940 and at that date Gerald was recommended for a Commission as an Officer. A short stint with the now No 12 OTU saw him duly commissioned as Pilot Officer on 23 July 1940, with effect from the end of his OTU posting on 26 June 1940. The speed of events so far was not uncommon at this stage of the war, and must have seemed very satisfactory. And at some point in this busy period, he had met Susan Hall. The balloon had by now gone up in the Middle East, too, so almost immediately he was on his way, only to suffer a period of irritation on arrival, posted first to No 102 Maintenance Unit. Gerald was one of many aircrew rushed to the Middle East only to find himself kicking his heels. Then at last, on 14 September 1940, he was posted to 211 Squadron at the age of 22. There in the desert they were now operating at a high rate, sometimes 6 sorties (of two aircraft each) per day, or “maximum effort” raids of 9 aircraft together. S/Ldr Gordon-Finlayson (GF, “The Bish”) had just assumed command of the Squadron following the loss of S/Ldr “Porpoise” Bax and his crew, shot down and made PoW on 4 September. Within a week of Davies arrival, The Bish had taken the young Observer under his wing and thereafter flew almost every operation with Gerald (Observer) and Arthur Geary (Wireless operator/Air Gunner) as his crew. Together, these three carried out 70 or more operations in the Western Desert and in Greece. 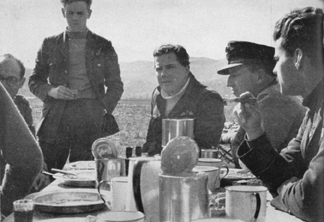 The Wings Over Olympus image shows Gerry Davies standing, left, with the Observer’s winged ‘O’ of his aircrew mustering visible on his tunic. Gordon-Finlayson seated, centre. In November 1940, Gerald and Arthur made it back safely with GF after his successful engine-out forced-landing of Blenheim I L8511 on a Corfu beach. This considerable feat is now commemorated by a plaque near the site. Heavily shot up by AA over Valona and with bombs hung-up, the wheels-up landing resulted in bombs bouncing along the sand behind them but without exploding. The returning trio were richly feted by Greek villagers all along the way: their adventure was illustrated by The Sphere and by Parade at the time, and soon retold with gusto in Wings Over Olympus. Gerald himself became something of a celebrity, thanks to his memento of Susan, the “girl he left behind”. But Gerald wasn’t so lucky on Easter Sunday the following year, lost in Blenheim I L8478 with his new CO S/Ldr AT Irvine and his usual crewmate P/O Arthur Geary, on the raid that saw all six 211 Squadron aircraft shot down over Florina with just two survivors. Painstakingly identified, at least some among the six lost Easter Sunday crews now rest in peace, thanks to the efforts of Marshall, Bryce, Dunnet, Quill and others in the late 1970s and early 1980s. Remembered with honour, indeed. Gerald Davies’ sister Ruby Williams and her son Nigel very kindly shared their long-treasured mementoes of Gerald and his record of service to make this page possible. Nigel continues to research the story of Gerald and Susan Hall, although there’s little now to go on. Still, given Gerry’s early service at RAF Sealand, Susan may yet turn out to have been a local girl. Ruby Williams died after a short illness on 18 May 2006. She was very proud of her brother—and of her son.